Background - LA-based, post-punk band Polyplastic share their music video for "My Prescription" off their just released EP, Not No. 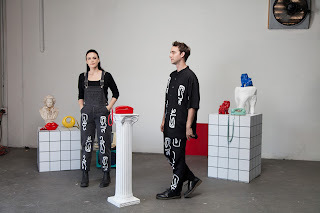 Polyplastic is the project of Los Angeles natives Charlie Ellis and Emily Ibarra. Inspired by his time as a welder in North Philadelphia, Ellis’s songwriting is influenced by industrial and post-punk genres, marrying lyrical melodies with angular guitar lines and a driving rhythm section. With a few bare-bones demos, the band started playing shows in LA and touring the US, supporting acts such as Wolf Alice, Ryley Walker, Draemings, and Tennis System. Polyplastic have released a few one off singles over the past few months, leading up to the release of their EP, Not No, due out June 29th. The band will be touring nationally, in support of the EP. TWITTER. Earlier this month we shared 'Next Slide' by Polyplastic and commented that - "The band develop intriguing post punk orientated music where the vocals are just right for the genre adding depth and passion, whilst the musical backdrop is solid and robust". With the new song and video for 'My Prescription' we have another musical treat, as their atmospheric music and creative visual interpretation pretty much confirms the duo are really carving out a distinct and compelling sound. Night Flight - God Knows. 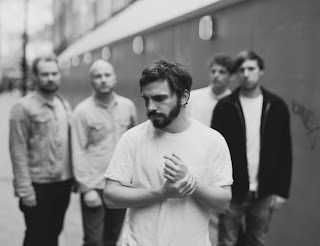 Background - London based band Night Flight have just released their much-anticipated second EP ‘Carousel’, featuring previously released singles ‘Parade’, and ‘God Knows’. The five-piece encapsulate sounds from a pleasing variety of eras and genres, with the EP offering up a stunning journey centred around topics ranging from the drive of chasing a dream, to personal defiance and resilience in search of closure. Alongside today’s EP release, the band are also sharing a beautifully shot video for latest single ‘God Knows’. Filmed across a stretch of fields in Wiltshire fields, strange geometric shapes begin to unfurl across seas of wheat and barley. Speaking a little on the new ‘Carousel’ EP, frontman and songwriter Samuel Holmes said: "Carousel marks a departure (band pun intended) from the itinerant lust of our debut EP. Exploring themes of self-doubt, nostalgia and a more contemplative tone”. The director of the ‘God Knows’ video Ben Cowan went into a bit more detail on the idea behind the visuals: "I wanted to weave intrigue and tension with light and landscapes in creating this narrative. Crop circles spark debate around the world, my goal was to build a story grounded in a simple understandable theory that is no-less impressive than the other wilder claims. The circles are both of the land and alien to it, part of the wonder and attention they draw is the precision and intricacy of the patterns, but here we find the simplicity of construction, the crop circle methodology more mind blowing, more fascinating than science fiction or fantasy... Just don’t get caught!” TWITTER. Back in April we shared the music video for 'Parade' and it's a real pleasure to be able to do the same now for 'God Knows'. We had this to say in our first feature - "Melodic and beautifully crafted the gentle vocals are totally engaging and the band deliver music with heart and quality, ensuring the emotion and feeling of this song resonates gorgeously." 'God Knows' is all of that with just a little more musical bounce this time around. I think it's reasonable to assume that Night Flight are firmly on Beehive Candy's radar.